A tongue-in-cheek comedy sci fi tale based on every sci fi trope ever. Plus a few sit com tropes thrown in for good measure. A lone driver in Nevada passes by a hitch hiker. Not far down the road, he gets a blowout, the hitch hiker jogs up to help change the tire, the driver is thereby forced to give the guy a ride. They do not get along well, and in listening to some music, pass a turnoff on this lonely road. 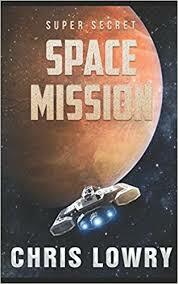 They end up at what appears to be a government military installation where they are summarily hauled inside having been mistaken for a couple of hot shot space guys who are needed for a mission. Lift off is nigh, they are forced into space gear and shot off into space to intercept a huge secret space station which has been taken over by aliens. Guess what they look like. Right. Alligators or reptiles. The only crew member left alive is a woman mechanic, who, coincidentally also is a trained pilot. The douchebag driver spends the rest of the book hitting on her, in all the sexist tropes you’ve ever read, and the second half of the book is devoted entirely to the battle between the reptile aliens and our little trio. Don’t forget the potty humor which should appeal the the ten-year-old-boy in all of us. Of course, the trio manage to escape the space station back into their shuttle and get home. Don’t know why I bothered reading this whole thing. Not particularly funny, tedious, predictable, and a couple of hours I will never get back. And there are sequels.